We have released our first Annual Report describing milestones and accomplishments achieved during the 2016-2017 fiscal year. Our scientists received national funding to support vital research projects aimed at improving treatment for people diagnosed with addiction and PTSD. HRI has established partnerships that will enable us to help military members and veterans suffering from Post-Traumatic Stress Disorder (PTSD) using an innovative cognitive training program. Research will be expanded to include police and first responders. HRI’s Post-Discharge Outcome Monitoring System (PDO) enrolled nearly 1000 participants. The PDO project, which collect evaluates the long-term impacts of addiction treatment, has gained national attention and will be used to inform care across Canada. 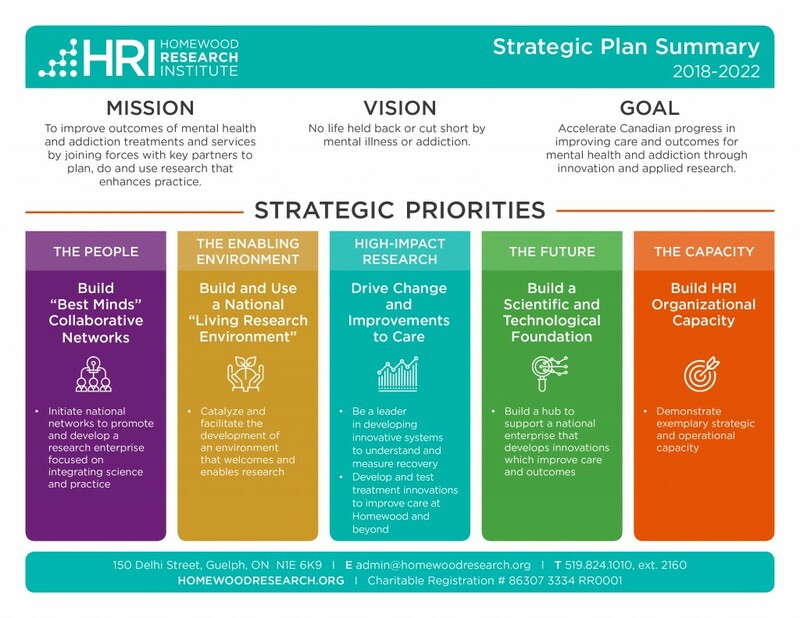 HRI established a new Strategic Plan to guide our growth over the next five years as we work to build a national enterprise with a more robust research program. As HRI embarks on a new and ambitious phase of growth, we are pleased to launch a new brand identity that reflects our sharpened focus on building collaborative networks to bridge research and practice. You will notice that the 2016-2017 Annual Report incorporates our updated branding. Our new logo signifies our unwavering commitment to making connections and finding solutions. Our icon uses an upward trend line, symbolizing improvement and transformation. Other visual elements, such as brand colours and imagery, represent calmness, hope, strength and impact. The logo places emphasis on the word research, because research is the foundation on which our organization is built. HRI has created an infographic summarizing early findings from the Post-Discharge Outcomes Monitoring System (PDO), also known to Homewood patients as the Recovery Journey Project. Post-traumatic Stress Disorder (PTSD) can occur after exposure to a traumatic event, such as witnessing death, serious injury or violence. It causes intrusive symptoms that interfere with daily function and quality of life. Common treatments for PTSD, including Prolonged Exposure Therapy (PE) and Cognitive Processing Therapy (CPT), have proven effective in reducing symptoms of PTSD. But a substantial number of patients do not fully recover following PE and CPT interventions. Recent emerging studies indicate that mindfulness-based treatments may prove promising as complementary or alternative approaches to further assist people suffering from PTSD. PhD Student, Jenna Boyd, in collaboration with HRI scientists Dr. Ruth Lanius and Dr. Margaret McKinnon (Boyd, Lanius, McKinnon, 2017) reviewed treatment literature and neurological evidence regarding mindfulness-based interventions for PTSD. The paper investigates the theoretical basis for the utility of mindfulness-based approaches in the treatment of PTSD, explores the overlap between neurobiological models of PTSD and the neurobiology of mindfulness, and discusses limitations and future directions for the potential efficacy of these approaches in treating PTSD.